ProofHub has integration with many third party apps like Freshbooks, Google calendar and iCal, Box, Dropbox, Google drive, Onedrive and Outlook. From manage apps, you can install/uninstall the apps and also, disable any section for account users. If any section like gantt or files etc is disabled then it will be disabled for all users. No user will be able to see that disabled section in their accounts. Click the dropdown menu icon present in front of any section or third party app’s name. To disable any section or app for all users, you can choose Disable option and no users will be able to see the disabled section or app in their account. You can also choose Uninstall option to uninstall any app and it will be uninstalled for all users. Select any app that you would like to install and its detail window will open. Click Install app button from left and the app will be installed. Click Manage apps and choose Marketplace. Select Freshbooks and an app detail screen will open. 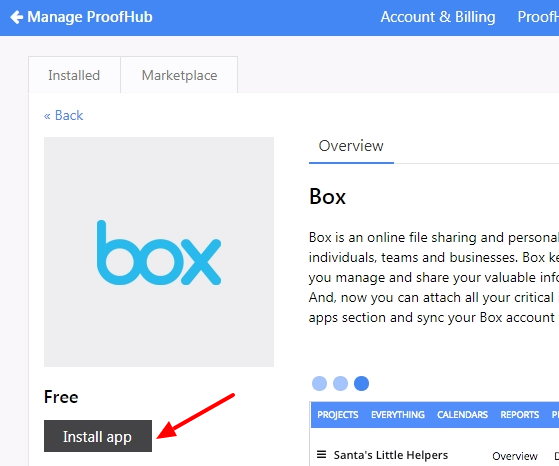 Click Install app, enter the API URL and Token from Freshbooks and click Install. 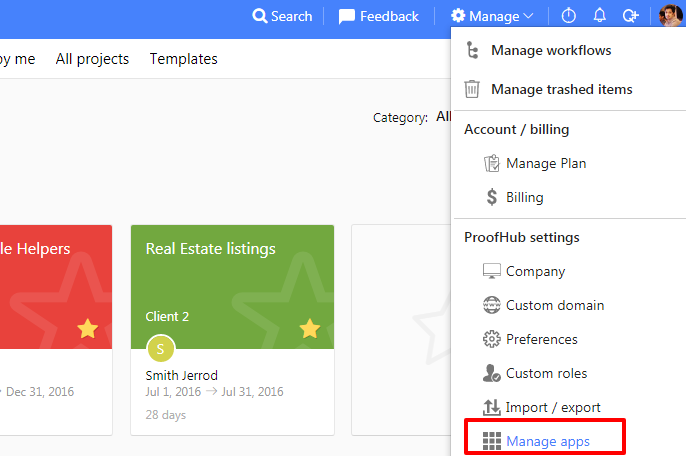 Settings can also be changed in case you want to integrate another Freshbooks account with ProofHub. Open your existing FreshBooks account or create a new one. Copy your FreshBooks authentication token and URL.